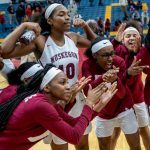 Apparently, Muskegon’s season-opening loss at East Kentwood ignited something within the Big Reds. That fuse must have been burning all season. On Monday, the Big Reds looked like they were shot out of a cannon in their 67-46 runaway victory over the Falcons in a Division 1 regional semifinal game at Grand Haven High School. Girls Varsity Basketball · Mar 3 Daz’Sha Day was voted to the five-member All-Freshman Team!